Once a week, we will have either Fried Rice or Bee Hoon Soup for lunch. Personally, I love Fried Rice. I love the fact that it is easy to put together. Over the years, I am proud to say that I had learnt how to fry a good plate of Fried Rice. So let me present to you our lunch for today. 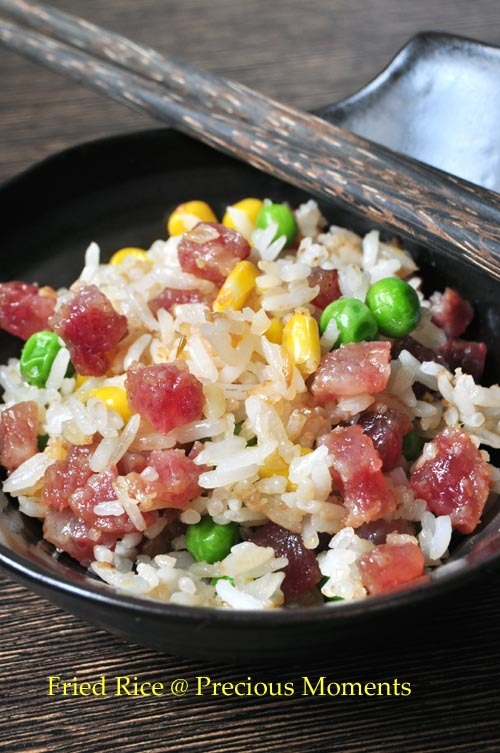 Lup Cheong Fried Rice 腊肠抄饭. Recently I was told that Fried Rice is actually classified as "heaty" food. Since it is starting to get really humid with the change in weather and topped off with consuming so much Lunar New Year goodies such as Bak Kwa. The Chinese believe we need to balance the yin and yang elements in our body. Son also started his trice a week soccer training, I also noticed that not only is he really tanned now, he also looks heaty. His lips are constantly red and swollen. As usual, it takes so much effort just to coax him to drink plain water. Thus I have been boiling herbal tea for the family. Saw fresh cane in the market and brew Fresh Cane and water chestnut Drink （馬蹄竹蔗）for us all. I usually get the seller to shorten the cane for me so that it is fits nicely into a pot. Cane are really strong and needed a strong and sharp cleaver to do the job. 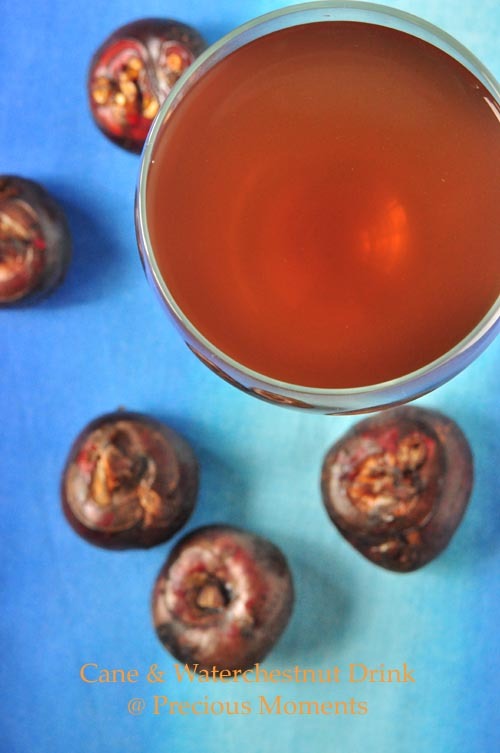 This drink can ease off the heatiness of our body and we love having it chilled. Brush and clean water chestnut well. Chop the cane into shorter stick. Slit them. Add 1.5 litre of water. 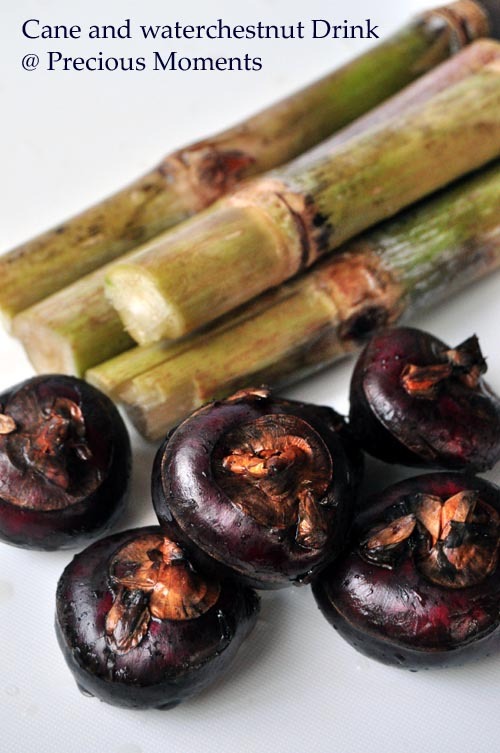 I usually shelf sugar cane & water chestnut, half / quarter them. Coincidentally I make this drink once every fortnight because my MIL has a sugarcane tree right out her front yard. My kids loved it and drank it like water! Love the fried rice, looks yums! Your fried rice is making me very hungry. Edith, I have something for you - check it at my blog. Pris, what is shelf sugar cane? Honey Bee Sweets, you are so lucky to have really fresh sugarcane! Thanks for the award Yummy Bakes! fried rice heaty or not also no problem..drink more leung sui! my mum always tell me that this is a very good herbal tea for reducing heat in our body..even better if boil using charcoal. Hi Edith! I like the idea of cane and water chestnut in a drink! Such a simple but cooling recipe, I definitely need to make some soon - the weather's really hot lately! Take care!